My latest manga passion is "Sgt. 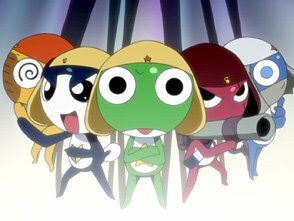 Frog" ("Keroro Gunso", ケロロ軍曹 ), by Mine Yoshizaki. It's cute, it's funny, it's clever... Sometimes while in the office I start counting the hours to come back home and read more of the books - see what the Sargent and his comrades will be up to next. As Natsumi-chan would wisely say: "these guys are up to no good..."
- Aki-san - the Mother, a manga editor, the "sek-see" character of the series. Their names (the Hinatas) are all related to the seasons and you can see signs for them in their bedroom doors: Winter (Fuyu, for Fuyuki), Summer (Natsu, for Natsumi) and Autumn (Aki, for Aki-san). 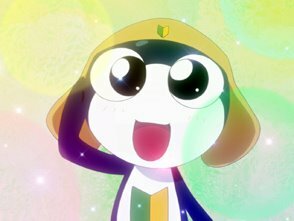 - Angoru Moa - Keroro's cute niece, powerful enough to cause earthquakes and destroy planets at a whim. She is also in love with her "uncle", and has Tamama (Tama-chan) as her arch-rival (though she doesn't realise that herself!). Lady Moa is also known as the "Lord Of Terror", although nothing in her sweet, docile appearance would suggest that. As for Keroro, he is green (d'oh! ), hyper-active and easily distracted and performs the Hinata's household chores as determined by Natsumi-chan. He could even suffer of attention deficit disorder or something. While he should really be actively involved in plans, reports and strategies for control of Pokopen, the only thing he can possibly think about is buying and assembling Gundam plastic models! The series is great fun and only God knows how much I identify with Fuyuki-kun's character: the outsider in school, looking for UFO's and ghost stories, super-shy and not good at PE at all! I was pretty much like that while in school, weird and always finding excuses for not attending those unbearable PE classes, ha ha! My favourite character though is Tama-chan. He's got the cutest eyes and expressions and, in spite of his split personality, is mostly lovely and well-mannered and polite. Tama-chan is also the younger of the aliens, and has a little tail, a tadpole tail (they are froggies in the end, no?). Aw! and he calls Fuyuki "Fukki"!! Ain't that just adorable??? And lastly, another funny character, which does not appear much, but I thought was hilarious: the Ghost girl (or Grudge girl), who lives in an abandonned room chez Hinata. She is a bit of a piss taken on the recent Japanese horror films, I think, and the idea is just excellent. I expected however they would use her a bit more. Let's see how it comes up in the next books, though.